As the Eskimos were said to have seven words for snow, today’s Americans have a near-infinite vocabulary for gradations of awkwardness—there are some six hundred entries in Urban Dictionary. How many mainland Americans, as children, hear that Eskimos have more words for snow than we – mere mortals — can even imagine? There is more legend than fact in the old cliche (it’s complicated), but it’s rooted in a truth we all learn at some point in our development: how language can evolve to help us navigate the particular worlds to which we are born. As a boy growing up in the sixties in New York, I was exposed to many words for venting, complaining, and otherwise toughing out life’s many indignities. The language was New York street Yiddish, from which I learned to kvetch when I am wont, schlep when I must, and turn on the chutzpah, when appropriate. In the New Yorker piece, the weird juxtaposition of "seven words for snow" with "a near-infinite vocabulary" suggests the author might have originally given a much higher count of snow-words, but then a fact-checker brought the number back to earth — and in so doing, spoiled the rhetorical effect. I mean, seven words? Really? Like how English has avalanche, blizzard, flurry, hail, powder, sleet, and snow? There is also pack, whiteout and even the white Christmas . More interesting is what Mr. Rodriguez's concludes from the story about Eskimo words for snow. …but it’s rooted in a truth we all learn at some point in our development: how language can evolve to help us navigate the particular worlds to which we are born. He probably should have said that it is rooted in misunderstanding of relationship between life and language. And indeed, after reading his article, I cannot figure out what exactly Ms. Lahti is trying to do. Is she trying to teach us to toughen up in the face of adversity by describing the semantics and pragmatics of the word sisu? Isn't it a bit primitive? I first learned the word "sisu" when I read http://en.wikipedia.org/wiki/Citizen_of_the_Galaxy in 3rd or 4th grade approx 4 decades ago. However many centuries into the future the book was set, there apparently still wasn't a perfect English synonym for it. I don't know why the people who feel compelled to cite the number of Inuit words for snow have not lodged onto the large number of synonyms for words like "water", "lotus", "woman" (as far as I can count, many more than that for the word "man"), "sun" and "earth" in various Indian languages. There are whole Sanskrit prayers which are essentially recitations for the various names of the the Sun, and the lack of an appropriate number of synonyms for "lotus" has been cited as one among several reasons why English translations of popular Indian epics often sound repetitive*, so the use of these allusions would even put our prospective snowclone wielder on much firmer factual ground. Another one of the advantages of citing examples from a culture that is geographically farther away (at least if our snowclone writer is based in the US or the UK) is that they can make up stuff about the socio-political ramifications of their lexical point without much ado (until, of course, someone from Language log notices). * Lutgendorf counts twenty-nine different terms for "lotus" in Tulsidasa's Ramcharatmanas. Could there every be a perfect synonym for any word translated to another language? As for sisu, maybe guts would be one, referring to both intestines and brawn. @J. W. Brewer: If you reread Citizen of the Galaxy, you may notice an offhand remark that the language spoken on the starship Sisu is "Suomic." It's typical of Heinlein to put in these all-but-unnoticeable touches. 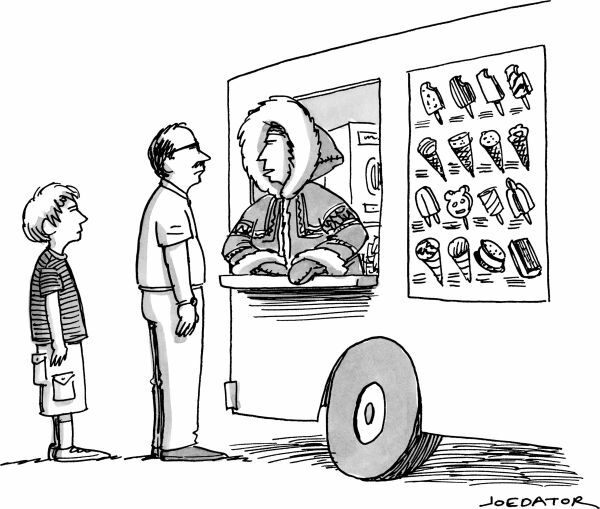 This week's New Yorker (paywalled; sorry) has an Eskimo/many words for/snow cone cartoon by Joe Dator. A relevant cartoon from the current issue of the New Yorker. Those poor Eskimos must have never experienced the wonder that is "(Sierra) cement" or "(California) corn" or "(Cascade) crud". Looks like John Lawler had hiccoughs back there. I'm not sure why Rodriguez doesn't consider the Arctic part of "mainland America." Is it because Alaska is so often shown as an island somewhere down by Hawaii? Ah, well, so did I.
Góðan daginn: My husband's niece and nephew, when they were young, had a rug that displayed the US states, with Alaska shown in the lower-left corner. They insisted to me that that's actually where Alaska was, a small island in the south. This was despite having actually visited the place. Unfortunately there was not a globe or atlas at hand to disprove their notion. The conclusion is inevitably that English has a word, "fun", for a concept that the other languages never needed. But I've seen the same argument used for French, Russian, and a bunch more… nothing special about Yiddish, apparently. Trying to track this down, I started wondering what exactly "fun" means that people are claiming is so inexpressible in other languages. Seems like a job for Language Log! Nobody said slush yet, right? Rodriguez's Yiddish examples seem completely beside the point – just a random draw from the 4 or 5 Yiddish words every goy knows. My wholly amateurish understanding is that because Inuit languages are agglutinative, combinations that would be adjective-adjective-noun or even noun-verb-adjective-noun etc, in Indo-European languages are single "words," resulting in an infinite number of "words" for snow – or any other thing. The New Yorker is on a roll. 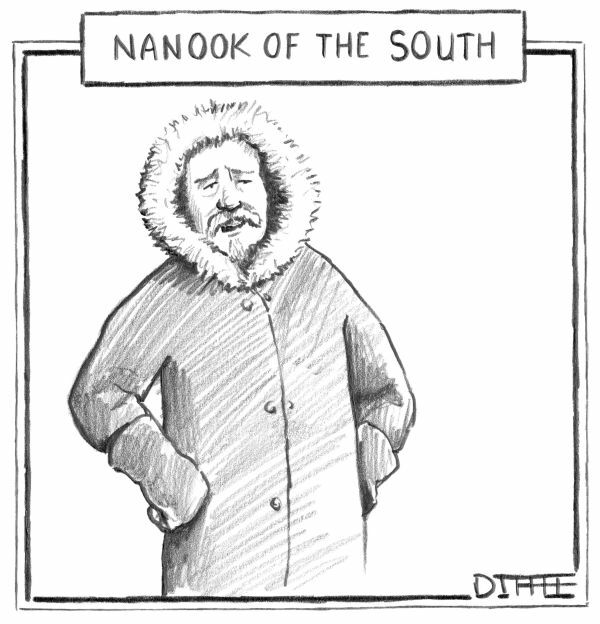 This week has a relevant Matthew Diffee cartoon on p. 54.